Story It was the fall of 2003 when a tragic event brought something so sweet into our lives. While going to pick up prom dresses with her friends, our sixteen year old daughter Sarah was involved in a near fatal car accident. It had been several years since we had a dog and felt it was the perfect time to give her a gift during her recovery. She named her “Promise”� and they spent months together in the bed becoming inseparable. 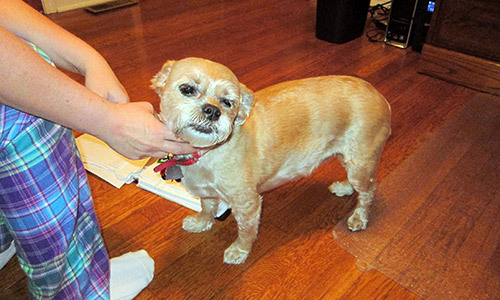 Promise is a Shih Tzu Yorkie mix with a youthful spirit that never seems to age. As the years passed, Promise and Sarah were always together. Sarah even had a special way of holding Promise cradled in her arms like a baby. A bond that was so strong that when Sarah’s name would be mentioned, Promise’s little bobbed tail would wag as if it was going a hundred miles an hour. Then the day came for Sarah to go off to college. She was always so anxious to hear when Sarah was returning and would run to the door wagging that tail as she would do a rolling growl and howl combination. We learned early on that Promise was a very talented howler. It is the most amazing thing to watch. 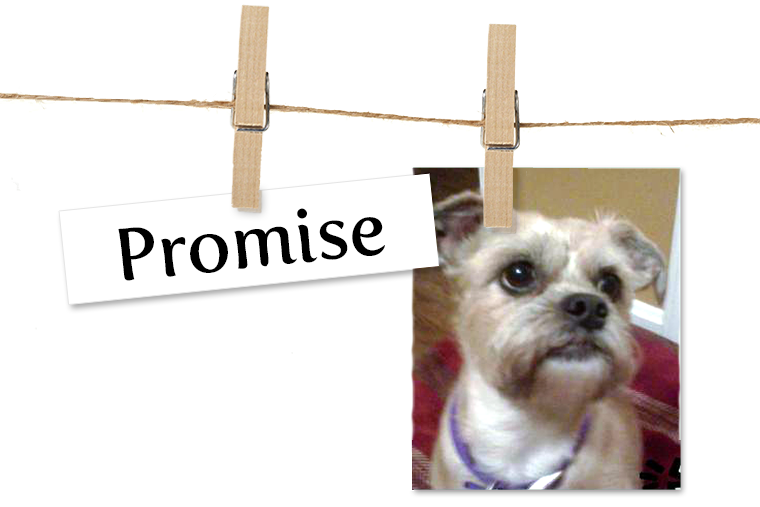 Promise is a dog of many talents, a very keen sense of smell, an amazing intelligence and a youthful spirit that spreads to the people she meets. Over time, Promise has developed that same deep relationship with every member of our family and in times of illness, Promise would be right there in the bed beside each of us. She gives of herself so unconditionally. It’s hard to put into words some of the many unique things about Promise, but here goes. When you look into her clear brown eyes it’s like the spirit of God is looking back at you. She has this unique and sweet smell that draws you in. Even as young adults today, Sarah and our other children come over after a very difficult day to lie with and smell Promise. A peace comes over them. Promise finishes our apples like eating an ear of corn side to side as we rotate the apple. And everyone that comes in contact with Promise, from veterinarians to strangers passing us on our walks, becomes drawn into her and senses this spirit that brings life. Throughout the years Promise has had three very close calls with death and we have been blessed that she made it through each time. As a puppy, she ate a sock which lodged in her intestines and almost killed her. At the age of eight, she got into some vegetarian taco meat that had a heavy onion concentration and her liver completely shut down. She could not walk, was losing weight rapidly, and had severe diarrhea and vomiting. Then at ten, she developed severe osteoarthritis in both knees and her left hip where she had hip dysplasia and knee surgeries. She was at the point where she could barely walk and her traditional vet was suggesting euthanizing. As a mechanical engineer trained in solving problems I was unwilling to accept it was the solution. During this time, both my wife and I were faced with two of the most challenging medical hurdles a person could face. My wife with severe and debilitating meniere’s disease and myself suffering a massive stroke. There was Promise again by our side in bed. As she lay beside our leg it’s as if you feel a calming presence and a sense of peace and reassurance comes over you. It was during these trials that my wife, I, and Promise found the unification of holistic and traditional medicine and lifestyle. The benefits have been nothing short of amazing. She is now 12 and doing great. This is “Our Promise,” a companion who has given and continues to give so much back to our family. 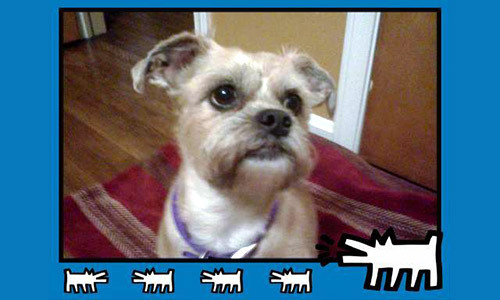 Did you like this week’s Pet of the Week? If you would like to nominate your pet for Pet of the Week, send us your pet’s story along with a photo to petoftheweek@entirelypets.com. If your pet is selected, they will be featured on our site and you’ll receive some cool prizes!